Note: This document is originally from work conducted with Ian Pearce and has been transcribed here for posterity. Read on for the original work conducted by us and largely aggregated via our old platform, 140kit. The Web Ecology Project is an interdisciplinary research group with presences in Boston, MA, New York City, NY, and San Francisco, CA that analyzes the system-wide flows of culture and community online. Please visit our website (http://webecologyproject.org) or contact us via email at contact@webecologyproject.org. Understanding the impact of social media in any event is of paramount value in today’s market - in the case of an advertisement campaign such as this one, it is absolutely necessary in order to evaluate the work done. At the same time, this platform is unlike previous mediums measuring the impact of something such as television, radio, or print can be done in a centralized manner an absolute volume of the campaign assets are produced and distributed for digestion. With an absolute volume, it is relatively straightforward to translate the resulting impact by comparing previous and current sales, perceptions, and other metrics surrounding the brand in question. With online content, although the volume of campaign assets created is set, its distribution is not. For this reason, it is necessary to sample the medium for responses to the campaign to begin to understand how users reacted to the campaign. the campaign, may be useful for the client. 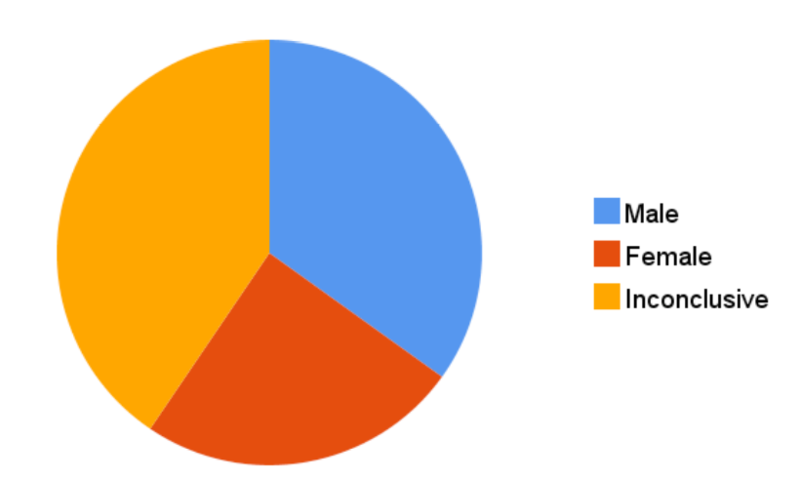 The general analysis of the data comprises a few core metrics available through the Twitter API that are generally easy to interpret for a quick and general sense of the data set. These analyses are either based on the Tweets or the Users Tweet analysis tells us what was said, User analysis tells us who was saying it. The General User Population shows data consistent with being an active, high-use population. 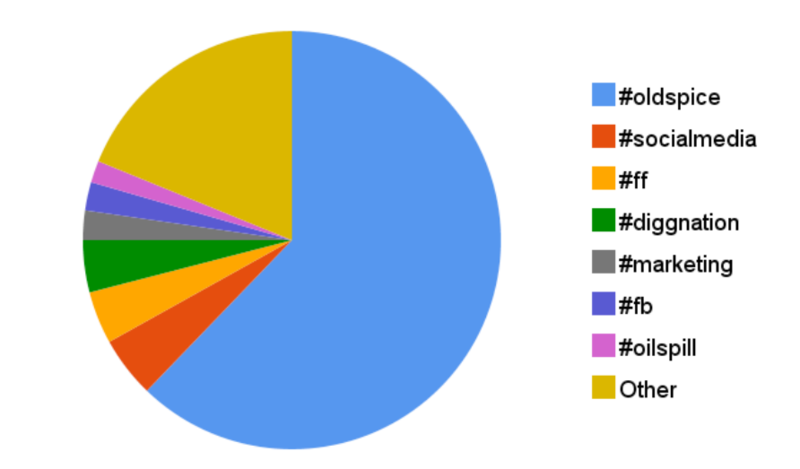 Fig 1: Average Status, Friends, Followers, and Favourites counts for Users in Old Spice data set (light blue) and random sampling of 100,000 Users. We were also able to use the TrueKnowledge.com Database to determine rough estimates for the gender of the users transmitting messages. Of the 60,251 Users, 4,007 were randomly sampled for gender 1,399 were male, 984 female, and 1,624 could not be positively identified as either. Although specific numbers are not immediately available, the TrueKnowledge.com Database has anecdotally exhibited an 80% accuracy with properly assigning gender to given names. 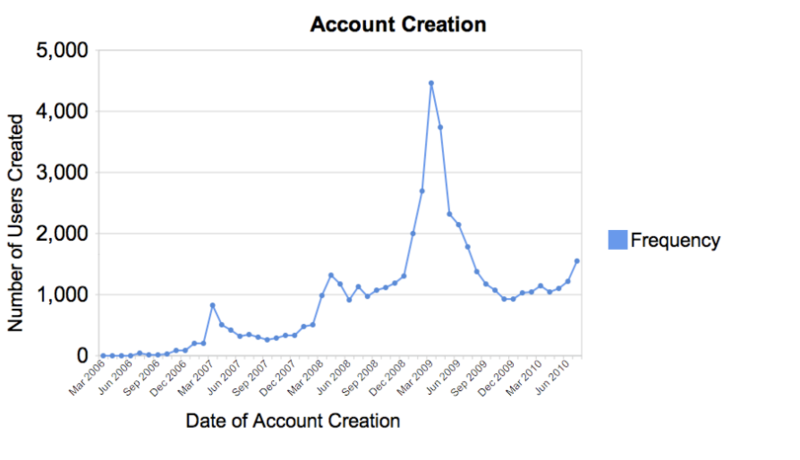 Fig 4: Account creation dates for Old Spice data set. The Users appeared to be primarily located in the US, with the notable exception of a few major international cities. 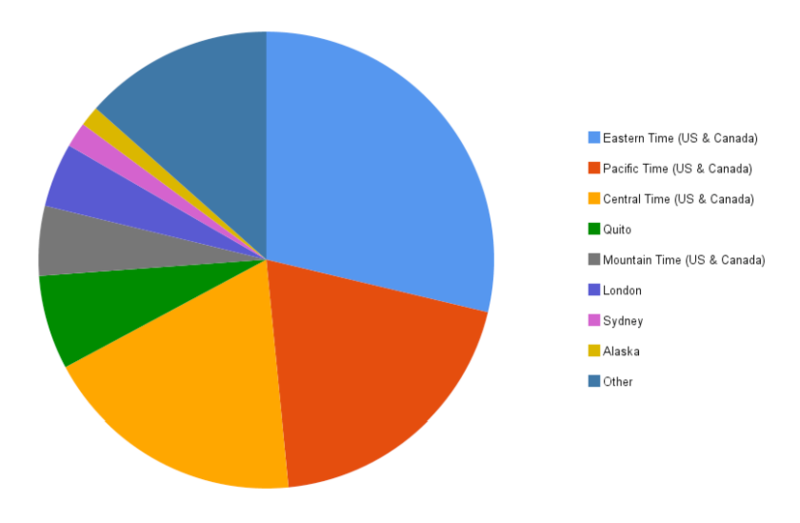 68.52% of the users were located in American time zones, which is generally reliable information. The general distribution of this data firmly lies with previous studies of a predominantly American base with international regions dispersed throughout. More specifically, as with most data sets, the Eastern time zone is the zone for the plurality of accounts. 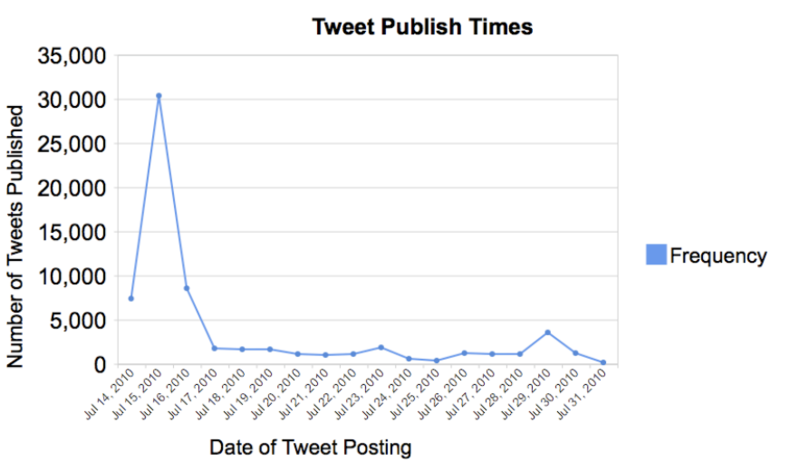 The content also shows a significant amount of news generated about the campaign being distributed and consumed on Twitter. ReadWriteWeb’s @rww account was posted most frequently only after Alyssa Milano and Old Spice’s Twitter accounts, respectively. Although stop-word omitted concordances are more comprehensive in the process of discerning and assigning values of all words used in the data set, it typically involves much more labor in determining actual value of the terms rather than using the ad-hoc hash tag approach that has become part of the culture on Twitter. In other words, by looking only at the frequencies of hash tags, it is possible to gain quick insight as to the qualitative nature of the Tweets by category. By and large, the bulk of hash tags employed in this campaign hinted at a primarily advertising-aware base; this is to say that instead of hash tags related to the content of the videos or the campaign, the hash tags appeared to be categorizing the campaign as a campaign. generally not performed as well when overtly conducted on a social media site. Interestingly, #ff, or Follow Friday, was employed frequently, which implies that Users are actively engaging with the brand, whether this engagement was with Mustafa’s account as the “Old Spice Guy” or the Old Spice account itself is beside the point. #SpiceBoy also provides a particularly interesting result – the creation of advertisement response videos essentially spreads the meme and evolves it to one more level without any more effort from the original creators. In fact, many response videos were created (as is well known). This response style of imitation is, in terms of internet memes, the sign of a bona fide adoption of the campaign into the online sphere. That the “Spice boy” video became widely adopted to the point of being a major subtopic suggests that this campaign is unique among many viral marketing campaigns in its ability to graft into the culture and be engaged by it. similarly reasonable – Fast Company, Huffington Post, and ReadWriteWeb are all popular content distributors and were displayed prominently. In response to Alyssa Milano’s challenge to Old Spice, the National Wildlife Federation’s account received a fair amount of traffic, and was spread through the system as much as Ashton Kutcher’s account, which speaks to a level of significance given Kutcher’s dominance in the network. 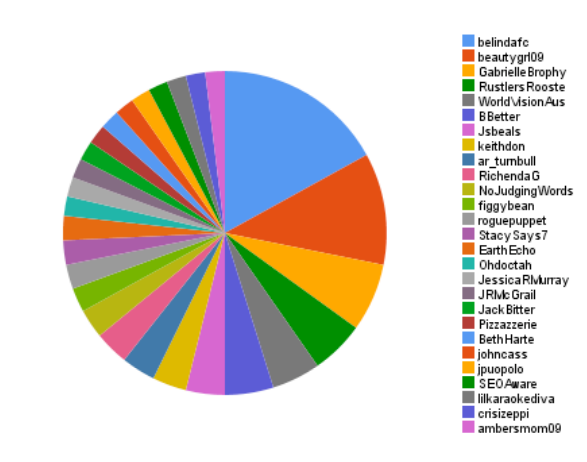 Fig 10: Top URLs, with YouTube sub-URLs counted individually. 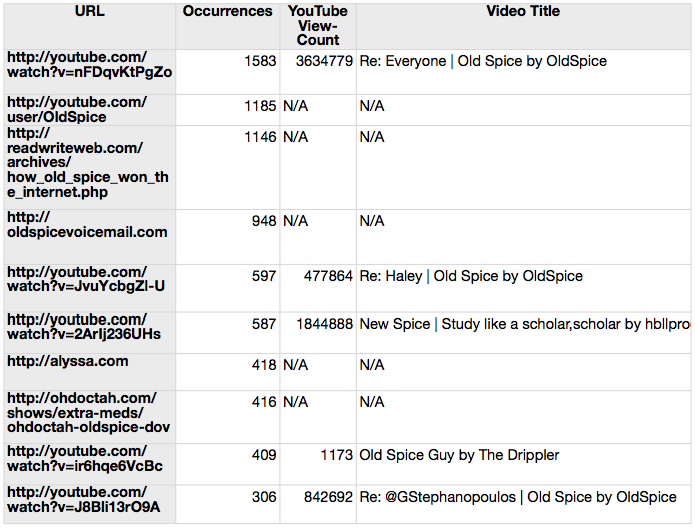 We compiled a list of all the URLs Tweeted in our data set and determined the number of occurrences of each URL. We expanded most URLs generated by URL-shortening services such as bit.ly. We also combined URLs that seemed to be merely variations of the same link. A total of 26,144 links occur in the set of Tweets. From these links, we found 6014 unique URLs. This list can be useful for finding related articles or websites you were previously unfamiliar with. Or perhaps more importantly, this URL histogram allows us see what Old Spice-related links were most often shared by Twitter users. 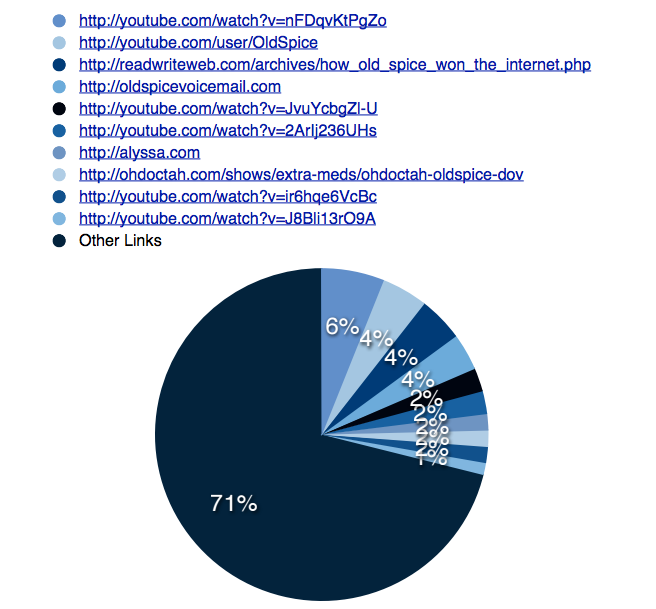 Looking at the list, we can immediately see that a large percentage of the URLs are links to YouTube videos. This makes sense given that the driving force of the Old Spice campaign is the Old Spice Guy videos on YouTube. within a targeted data set. Identifying information in tabular forms of occurrence is useful, but the most accurate way of mapping information in a social network is by using the much more analogous network graph. re-tweets or direct mentions) and Alyssa Milano only 318 times, but the disparity takes away from actually understanding the long tail of distribution, so Old Spice’s account has been highlighted to note this difference. Redder nodes correspond to users closer to the central part of the graph – the reddest are one degree of separation from Old Spice, and the cooler nodes are farther away. To put it shortly, most graphs have multiple important users, and as a result, cast a much wider net of users to respond to the major users. This graph does not share that feature, and as a result, much of the communication is one-to-many. The graph screenshot was pruned to eliminate almost 18,000 users (so as to only isolate the major users), so the large sunburst of data going from Old Spice outwards is not present (nor is it a compelling graph). The communication between other users, and from users out towards more users, is most important, and is not clearly happening as much as it would in a non-centralized graph. That is not to say that the network doesn’t suggest any successes. In fact, the vast dominance of the Old Spice account speaks to a large degree of efficacy in being able to control the campaign from one central position and spread the information outwards. 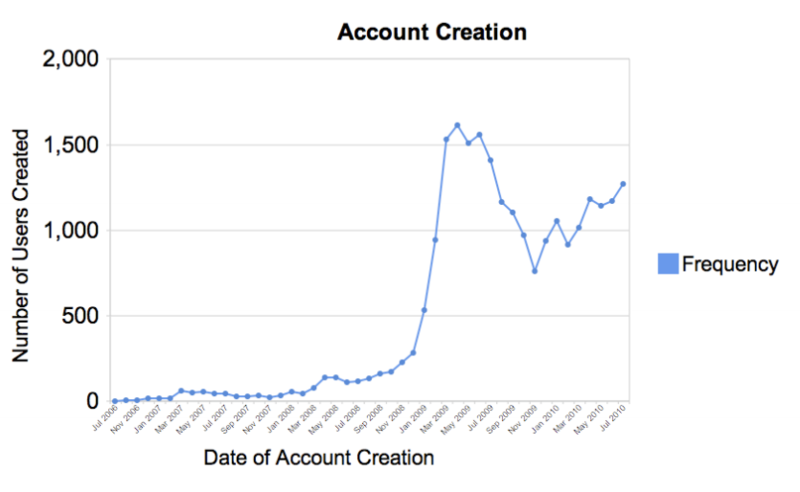 The results of this success are seen in numbers such as the significant uptake in followers for the account after the campaign. 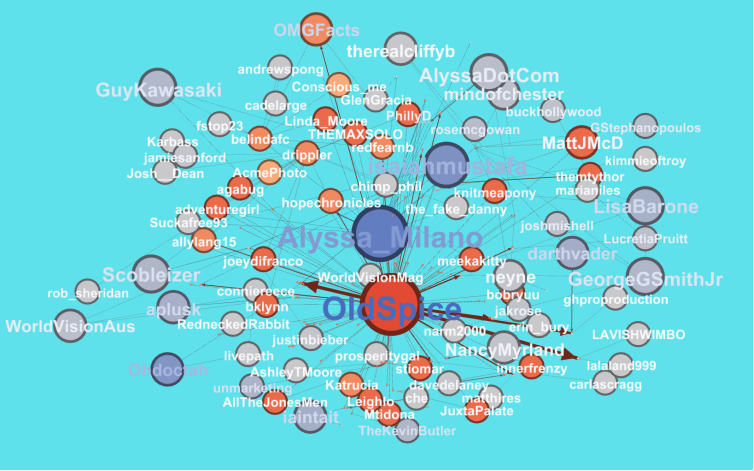 outliers OldSpice and Alyssa_Milano, are shown below. 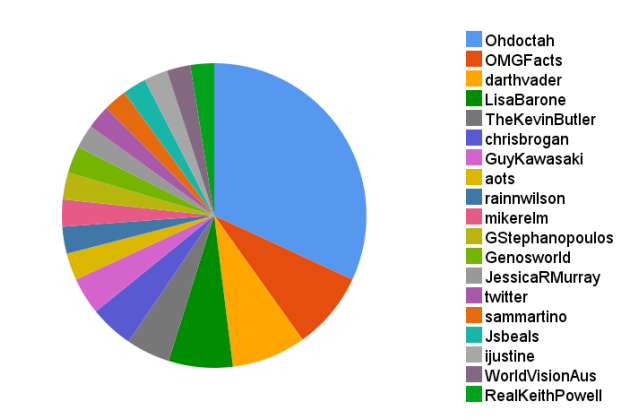 Fig 13: Most influenced Users (omitting “drippler” and “BobbyTheBlue”) in re-Tweet network. 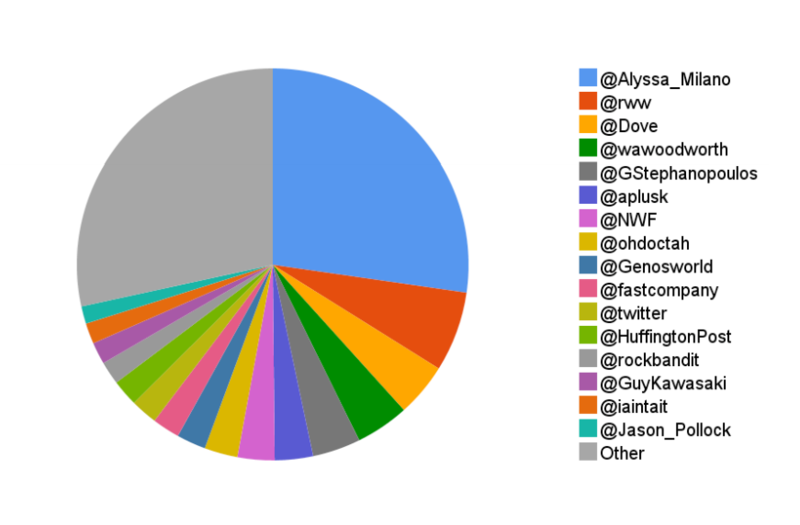 This is determined by the number of times these Users referenced other Users in the network. On the other end of the spectrum, there are highly influenced users; generally, these are people that are simply spamming by re-Tweeting or direct mentioning accounts often (in order to show up in the search results for a given subject more often). While a few users (notably, “Drippler” and “BobbyTheBlue” with 202 and 41 in-degrees, respectively) were almost certainly attempting to exploit this, a few users were able to be influenced and in turn influence other users–the best example of this is “OhDoctah”, who influenced 89 users as a result of his 4 re-posts of @OldSpice Tweets. 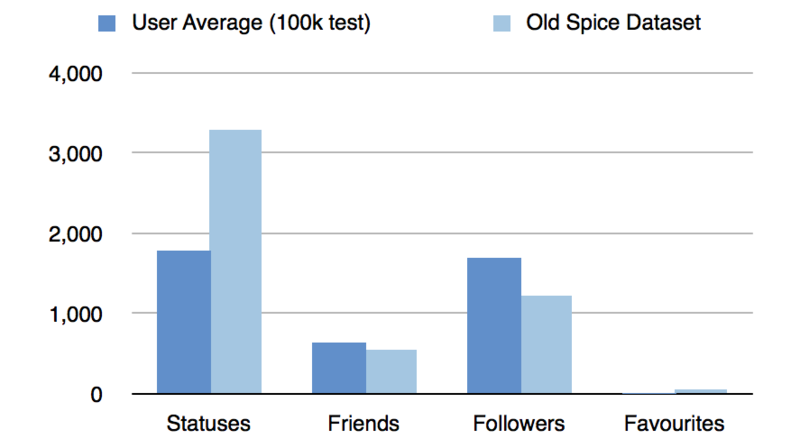 The Old Spice data set is profoundly rich. 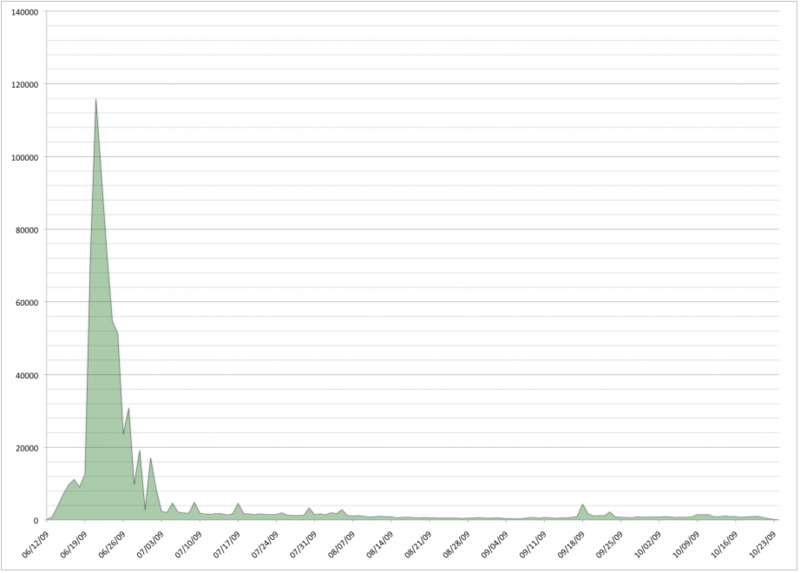 Through multiple dimensions of analysis, we were able to confirm that the conversation on Twitter was likely beneficial to the overall campaign. The largely American, primarily male audience both spread direct Old Spice content as well as derivative response content, ensuring an intrinsic memetic value in the campaign, which has lasting impact on the social media sphere. Some of the most shared links directly tied back to campaign assets - the ones that did not were primarily either response videos/derivatives or news articles surrounding the campaign. In either way, negative content was not seen from the top responses, which implies general acceptance of the meme in the online sphere. By using network analysis, we were able to show a general sense of the distribution of Tweets in a clear high-level view. The data appeared to emanate primarily from the central hub of the @OldSpice Twitter account and quickly dissipate from there - (there were not long trails of re-Tweets as can be seen from time to time, but are rare). The vast preponderance of re-Tweets referencing @OldSpice’s account suggest a high degree of centralization of network traffic, which means in turn that the account was likely successful in curating its own traffic and generating the types of data it desired, rather than having other users alter the messages and pass them along. The lack of negative hash tags similarly support this thought. Although there were a few spam accounts posting data about Old Spice (as is to be expected), there were a few notable accounts such as OhDoctah that both referenced Old Spice while cultivating their own following as an offshoot or derivative subject to the primary subject. A participatory Tweet is one that either specifically references another Tweet (a “re-Tweet”) or one that simply mentions another user (a “direct mention”).